An institution where Talmudic scholars are given free lodging, and often a stipend in addition, in order that they may devote all their time to the study of the Talmud (sometimes also to teaching and lecturing). From the seventeenth century it became a custom for wealthy people to donate funds for the perpetual maintenance of such institutions (called sometimes Bet ha-Midrash). It is said (Gans, "Ẓemaḥ Dawid," part i., ad 5352 ) that Rabbi Löw ben Bezaleel founded the klaus of Prague, which is still in existence, though used only as a synagogue. 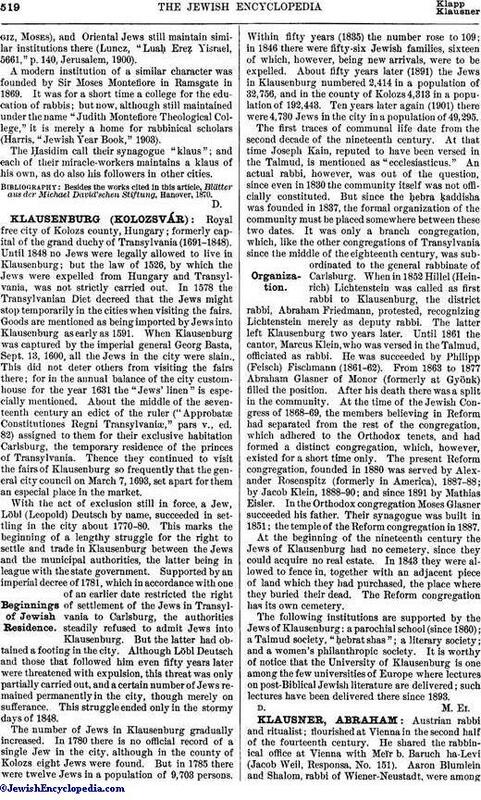 The klaus at Vienna was founded by Zechariah Levi in 1656 (Kaufmann, "Letzte Vertreibung der Juden aus Wien," p. 67, Vienna, 1889); and a similar institution was established at Altona about 1690, when Ẓebi Ashkenazi was in office (Emden, "Megillat Sefer," p. 11, Warsaw, 1896), to which Benjamin Levy of London bequeathed a legacy in 1704 ("Jewish Chronicle," July 31, 1903). Bermann (Berent Lehmann) of Halberstadt founded in 1703 the klaus still existing in that city (Auerbach, "Gesch. der Jüdischen Gemeinde Halberstadt," pp. 61 et seq., Halberstadt, 1866); Lemle Moses Reinganum founded that of Mannheim, 1706 (Löwenstein, "Gesch. der Juden in der Kurpfalz," pp. 170 et seq., Frankfort-on-the-Main, 1895): its funds are at present used for the maintenance of a second rabbi. About the same time Samson Wertheimer founded a klaus at Frankfort-on-the-Main (Kaufmann, "Samson Wertheimer," p. 72, Vienna, 1888). Jost Liebmann and his wife, Esther, founded in Berlin a klaus for their nephew and son-in-law, Aaron ben Benjamin Wolf, about 1701, which was discontinued about 1712. Somewhat later Veitel-Heine Ephraim founded in the same city a klaus which is still in existence, although under entirely different rules, and known as the "Veitel-Heine Ephraim'sche Lehranstalt." The Breslau, Hanover, Lissa, and other German congregations possess institutions of the same kind. In Wolfenbüttel various members of the Samson family founded similar institutions; these in 1807 were united to form a school which is still in existence as a Jewish high school (Ehrenberg, "Die Samson'sche Freischule," in "Orient, Lit." 1844, No. 5; separately printed, Leipsic, 1844; Zunz, "Samuel Meyer Ehrenberg," Brunswick, 1853). In Leghorn, which had a wealthy Jewish community, various institutions existed intended to support prebendaries who should devote their lives to Talmudic studies, occasionally delivering lectures; as was often the case in other parts of Europe, with such an institution, called "midrash" or "bet ha-midrash," a synagogue was usually connected. In the midrash founded by Franco, Elijah Benamozegh held a position (Sokolow, "Sefer Zikkaron," pp. 128 et seq., Warsaw, 1889). Wealthy members of the Leghorn community often supported such a midrash in Jerusalem (see Ḥagiz, Jacob, and Ḥagiz,Moses), and Oriental Jews still maintain similar institutions there (Luncz, "Luaḥ Ereẓ Yisrael, 5661," p. 140, Jerusalem, 1900). A modern institution of a similar character was founded by Sir Moses Montefiore in Ramsgate in 1869. It was for a short time a college for the education of rabbis; but now, although still maintained under the name "Judith Montefiore Theological College," it is merely a home for rabbinical scholars (Harris, "Jewish Year Book," 1903). The Ḥasidim call their synagogue "klaus"; and each of their miracle-workers maintains a klaus of his own, as do also his followers in other cities. 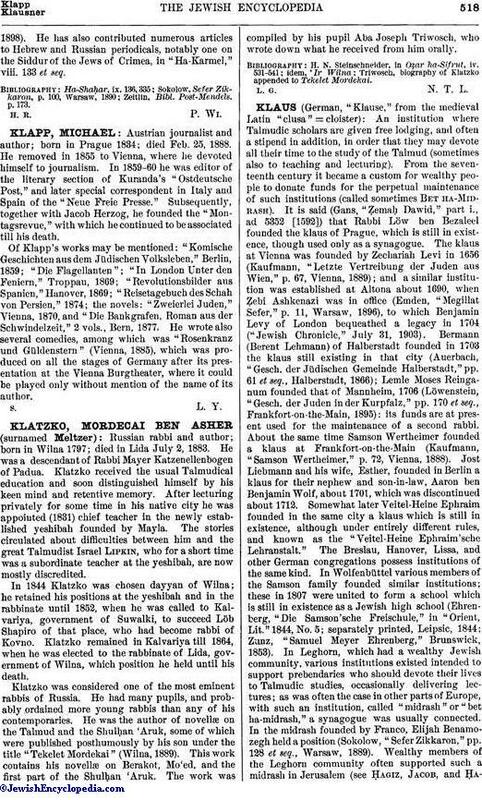 Besides the works cited in this article, Blätter aus der Michael David'schen Stiftung, Hanover, 1870.